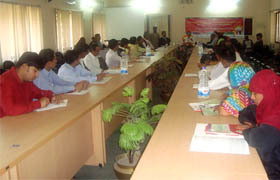 Advocacy workshop on Youth Friendly Health Services held at S.A.Bari Conference room, Comilla on 17 February. The meeting was presided by Dr. Md.Samshul Haque, Civil Surgeon, Comilla. Mr.Monjurur Rahaman Deputy Commissioner of Comilla was the chief guest in the Meeting. Guest of Honor of the meeting were Sajeda khatun (DD-FP), Md. Moklesur Rahman (DD-Youth), Dr. A.K.M Shamsuddin, National Adviser, Youth Friendly Health Services (Ex- ADG, Health), Dr. Mohammod Ali, Advisor- YFHS, Chittagong Division.